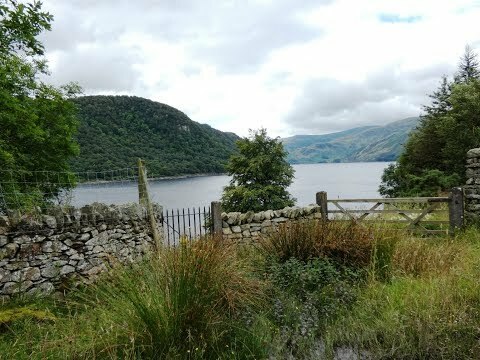 Burnbanks is a very small village built to accommodate the men and their families who were employed in building the dam at the southern end of Haweswater. Sixty-six bungalows were built, with a mission room, recreation hall and large huts for single workmen. Today the village contains only about 20 houses some of which have been built on the original foundations of the former homes of the men who built the dam in the 1930’s. At near-by Naddlegate there are six bungalows which were built for the engineers and managers who came to work on the dam. Bampton Common lies to the west of Haweswater and below the 2,000 year old Roman Road, High Street, built by the Romans to connect their forts at Brougham near Penrith and Ambleside. The road includes the peaks of Wether Fell, Red Crag, High Raise, the highest peak High Street named after the road and Park Fell. As we enter the village we bear to the right past the telephone box and an information board. We go through a gate and turn right then bearing left on a broad track. We are soon in to Open Access Land and we keep bearing left following the trees. We start to head downhill slightly to the lake. At the lake we keep heading forwards following the wall on our left. We go through a gate, pass an information board, and keep heading forward. We cross the bridge over The Forces (waterfalls) and head forward starting to go uphill. We soon bear right and start to climb steeply with the waterfall on our right. At the top of the falls we go through a gate then head forward to cross over the bridge. We keep following the path bearing slightly left steeply uphill through the fern. At the brow we cross a tiny stream and bear left. We head forward and then bear right to pass below the cairn we can see in the distance on the right. We keep heading forwards following the path through the dip and the end of the lake soon comes into view again. We start to steadily drop downhill and as the path splits we keep heading downhill bearing left to a ford. We cross the ford and bear right through the depression between the two hills heading towards some trees in the distance. We soon pass a farm on our left and drop down into the dip. We pass a gate on the left and keep heading forward up the other side following the footpath sign with the wall and trees on our left. We head forward through the ferns ignoring a gate and a stile down below on our left and keep heading forward with the wall on our left. When we see a track going off to the right between two hills we turn sharp left down to a gate in the wall. We do not go through the gate but turn right staying on the Open Access Land following close the wall on a narrow path. We cross over a tiny stream and keeping the wall and stream on our left we start to go downhill. As we drop down we bear off slightly right still with the wall on our left through the field towards the trees in front of us. At the trees and the end of the Open Access Land we go through a gate and turn left along the lane then retrace our steps back to our car. This is an easy to moderate walk on gravel/grass paths and tracks. There is a steep incline alongside The Forces (Waterfalls) and after crossing the bridge at the top of the falls. Elevation: approx lowest point 205.40m (673.88ft) approx highest point 549.70m (1803.48ft) approx ascent 418.10m (1371.72ft). Approx 3.5 miles allow 3 hours using OS Explorer Map OL5, The English Lakes North-eastern area, Penrith, Patterdale and Caldbeck. This walk is done clockwise. Start point: At the side of the main road near the right turn into the village of Burnbanks. From the A66 at Penrith take the A6, Kendal road, and take the first right at Eamont Bridge to cross over the M6. Take the first left and follow this road through Asklam, Helton and Bampton then take the small road on the right into Burnbanks. Parking: Free parking at the side of the main road near the small road on the right into the village of Burnbanks or in the village itself.